A dental crown is essentially a prosthetic cap cemented over a damaged tooth to restore appearance and functionality. One type of dental crown are porcelain crowns, which are considered to be one of the most aesthetically pleasing types of dental crowns due to their translucent color. Because of this translucent color, porcelain crowns are most commonly used for front tooth restoration. Individuals who have fractured or large fillings, a tooth with a root canal, or broken, fractured, or decayed teeth and are looking for cosmetic enhancement are ideal candidates for porcelain crowns. Porcelain crowns are especially useful in cases where the tooth cannot be restored through fillings or other types of restorations. In some cases, porcelain crowns can be used in children on primary teeth. They are most often used to save a tooth that cannot support a filling due to damage from decay. They can also be used to protect children’s teeth from decay. Another possible use is to decrease the frequency of sedation in children who are not able to keep up with oral hygiene or fully cooperate with dental procedures. There are different types of porcelain crowns including traditional, empress, procera, lava, zirconia, and emax. Traditional porcelain crowns are made from feldspathic porcelain and is considered to be the most beautiful. Empress crowns have a glassy appearance and can be classified as ceramic. Procera crowns are exceptionally strong because it has milled ceramic on the inside and porcelain on the outside. Lava crowns are made with zirconia on the inside that gives the crown a pleasing appearance on the outside. Zirconia crowns have the most natural look in both their coloring and the fact that they don’t have a black line along the gum line like other crowns. Finally, emax crowns are long lasting, highly aesthetic, and gaining in popularity. 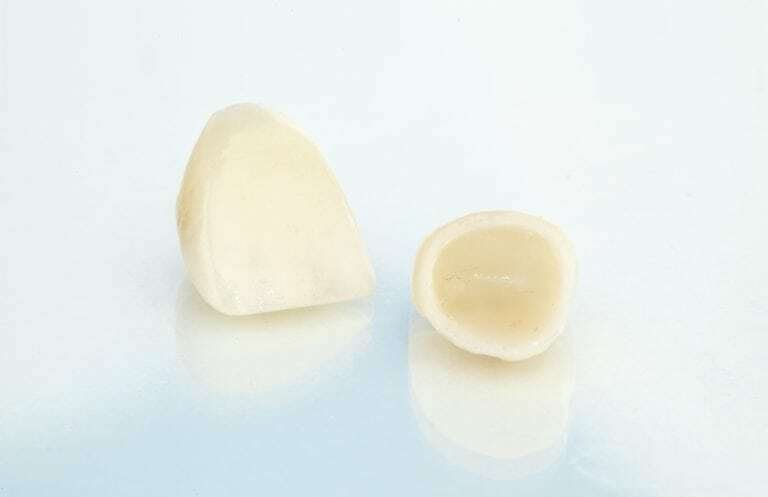 Porcelain crowns are generally well suited for those individuals who have allergies to metals, however some porcelain crowns can be fused to metal. PFM crowns are much stronger than simply porcelain crowns and have more durability. PFM crowns are composed of metal shell that fits over the tooth, with a porcelain veneer fused to the front. These crowns may not be as visually appealing as full porcelain crowns, however they have a higher amount of durability and a lower cost. Porcelain crowns are placed in a similar fashion to other types of dental crowns. First the tooth is prepared for crown placement by being cleaned and reshaped to accommodate the crown. Then, dental impressions are taken and sent to the lab as a model for the new crown. In the 2-3 weeks it takes for the lab to fabricate the permanent crown, the patient is given a temporary crown to wear. In preparation for the permanent crown, the designated tooth is roughed up with etching acid to help the crown bond onto the tooth. Once the crown has been properly adjusted and is in the desired position, it is fixed to the tooth with dental cement.